Katie Grand -the former editor of Pop Magazine – ALWAYS gives us the wow factor. This woman is not afraid of fashion. 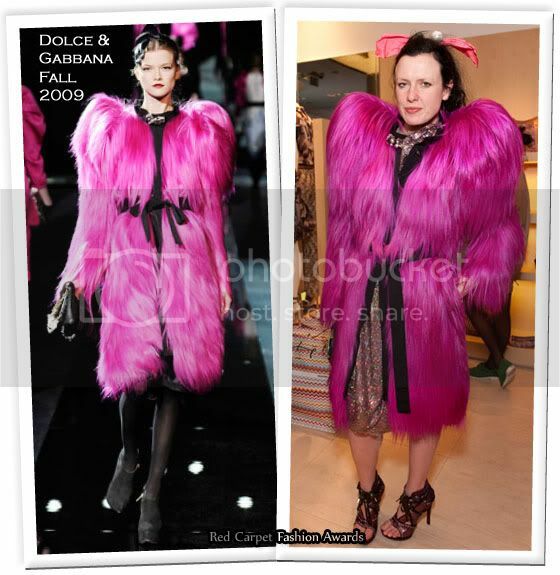 Not only is she wearing a wooly mammoth fuschia pink Dolce & Gabbana Fall 2009 coat, but she also has Louis Vuitton Fall 2009 bunny ears, as a hair accessory. Her amazing look is complete with Louis Vuitton Spring 2009 heels and a sparkling pink – barely seen – dress. Fierce. Only Kate and Roisin Murphy can get away with this look. Jacquetta Wheeler is having a great week, as this is another fabulous look for her. The model wore a Missoni Maranta silk kimono dress. The colours are bright, as you would expect from Missoni, but it doesn’t feel like she was trying too hard. She picked a different multi-coloured belt from the runway, and she completed her look with a woven white bag and gold strappy heels. Jacquetta didn’t try to hard, but I feel Gemma Arterton did. In an attempt to be cute, this comes off as desperately trying to stand out. The colours I feel don’t suit her. The runway version would have been better for her. Her pumps are the only thing I like here, as I’m also tiring of that same hairstyle for every event. I really loved Jade Parfitt’s Missoni Hedda print dress. The multiple colours really drew me in. The model modified the dress from the runway, making the voluminous sleeves and the skirt shorter. Her dress was complimented well with a pair of silver heels. Although I can see the lining of Jade Jagger’s dress and her bra under her dress, this Missoni Brina ruffle tunic dress, was a great choice for the designer, and very typical of her laid back style. The colours work well with her skintone, and the ruffles on the side are a cute touch. Margarita Missoni wore a Missoni one-shoulder navy dress. It’s not the most colour piece of all the collections, but as host, she no doubt didn’t want to hog the limelight. What may not be immediately noticeable is the silver lurex all over the dress, which shimmers in a quite way. Posing with the head designer Angela Missoni, Jasmine Guinness wore a knitted Missoni Vivace fringe dress. The two-tone dress has a contrasted banned hem, which Jasmine compliments with a matching belt. 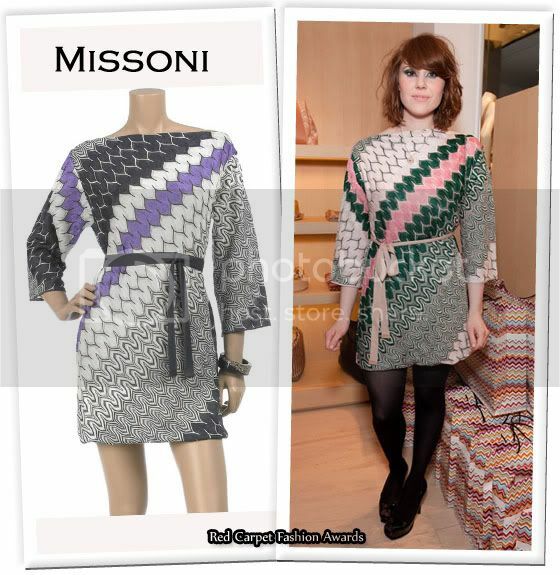 I love Kate Nash’s style, and I feel this Missoni Rosetta woven dress was perfect for her. It’s cute, sassy, colourful and pink really compliments her milky complexion. Like Margarita and Jasmine, she wore tights with her look.